Two weeks ago we were on the front page again. This time it was just an update on the process. 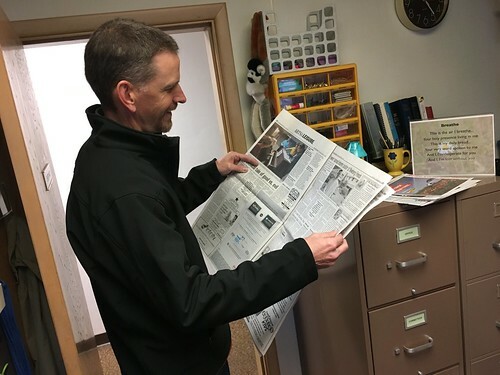 Today’s paper was in plain sight on my filing cabinet when Steve, soon to be interim pastor, noticed it and asked if we’d made the front page again. No, but . . . [I paused while he paged through to find this] Past the sports section he found an article about himself. The picture in the article, taken when he spent a sabbatical month at the Trappist Abbey in nearby Lafayette, might imply our pastors wear robes in the Quaker church. On Sunday the deciding process begins at NFC with an informational gathering. The schedule shows it concluding on May 7. Quakers don’t vote, so the steps taken toward a decision will include a survey, sessions for each side to share reasoning, and a midway gathering to hear survey results. The leadership team, having considered all the parts, will offer a recommendation at the May 7 meeting. There will be no real winner; everyone will suffer loss of one kind or another. Mauri is still a member and will enter into the discussions. I recently removed myself from membership because I’m happily connected with Hillside Fellowship, a multi-denominational church not far from home. 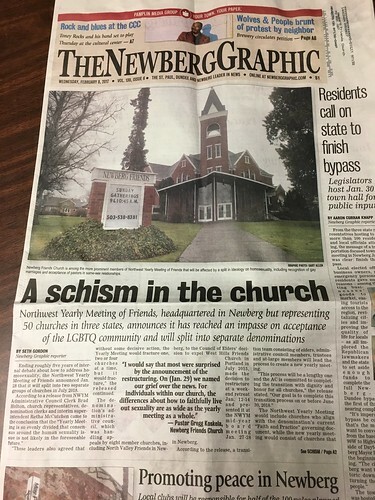 But I’ve loved (still love) my job at NFC for nearly 14 years, loved (still love) my coworkers like family, loved (still love) many from the NFC congregation (my church home for 20 years). So I care very much about the decision they will make.